BBC NEWS | Health | Was the new finger a 'natural' miracle? Was the new finger a 'natural' miracle? 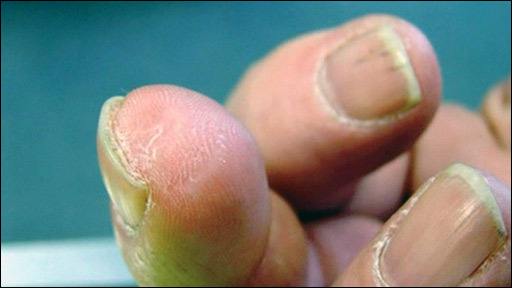 The story of the man who re-grew a finger using "pixie-dust" has captured the imagination of many this week. But a number of scientists have cast cold-water over the claims - and said it may have been a "natural" miracle. Lee Spievak, 69, chopped off part of his finger - said to be almost down to the first joint - in a model aeroplane accident in 2005. His brother was working in the field of regenerative medicine, with Dr Stephen Badylak at the University of Pittsburgh. They provided Mr Spievak, who lives in Cincinnati, Ohio, with the "pixie-dust" - more accurately called extracellular matrix, which he sprinkled on his finger. Extracellular matrix is, essentially, the support structure for cells which is present in all animal and human tissue. In this case it was taken from an extract of pig bladder. Within weeks, it is said the tip of the finger - including bone, tissue, skin and nail grew back. Dr Badylak's team had previously been working on regenerating much simpler biological structures using the extracellular matrix. That is something that numerous teams of scientists across the world have been pursuing for decades. Extracellular matrix is just one of the "scaffolds" for supporting new cell growth. But re-growing a fingertip would be a significant step forward. Professor Stephen Minger, an expert in stem cell and regenerative medicine at Kings College London, said: "This is where my scepticism comes in. It would be a really complex task. "At the moment people are trying to figure out how to make heart, brain and liver cells. "I don't see how they could re-grow a fingertip by sprinkling on extracellular matrix." Mr Spievak says he has regained feeling in his finger. But Professor Minger said: "When people have a fingertip reattached, the nerves don't re-grow and people have no sense of pressure, or of pain." Scientists say they want to see research by Dr Badylak published in peer-reviewed journals - which means work has been assessed by other experts - rather than simply hearing anecdotal reports. Simon Kay, professor of hand surgery at the University of Leeds said he suspected that Mr Spievak had sustained a "very common-or-garden, mundane fingertip injury" which had not affected the bone or led to the loss of the nail. Lee Spievack lost his finger in the propeller of a model plane. He said that the tip of the finger had amazing natural healing powers, which may not be universally recognised. "It appears to regenerate because new skin grows over the end of the finger - that's a normal recovery." If there is any tissue remaining on top of the bone, the person will even retain a "tip". "It's quite a remarkable process. "It can be utterly surprising how well it repairs after what appears to be a ghastly injury but it's what you might expect from the most peripheral part of the body."